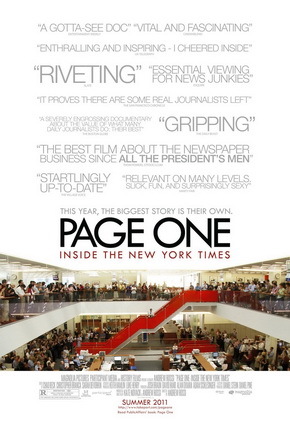 There’s not a lot in Page One: A Year Inside The New York Times that you didn’t already know. For anyone with the faintest interest in digital media you’d be aware of the ongoing conflict between newspapers and Internet culture. In the eyes of many people online blogs and social networking sites, such as Facebook and Twitter, are reducing the relevancy of print media. It raises questions of accessibility and punctuality: why should people still purchase a newspaper anymore when they can freely obtain the same information online and in many cases earlier too? The argument is topical and presented here with balance and cohesiveness. But the documentaries few revelations and limited scope ensures that most viewers should not pay full price to see this at the cinema. As with Cave of Forgotten Dreams (2011) this is a documentary you could happily watch at home on television, without losing its impact. And there is certainly some intriguing material that makes it worth watching in one medium or another. Drawing from recent headlines smartly prevents the documentary from becoming a history lesson and provides a contemporary relevance. One of the more damaging recollections is that over one hundred workers had to be sacked from the Times because of the falling revenue. There are also interesting snippets discussing the shame that journalists like Judith Miller brought to the Times when she falsely reported on the War in Iraq and was then sacked. It’s shown as a huge blight on the reputation of the paper that has been sustained for decades. How profoundly reputable the Times has been is something I wasn’t aware of till now. We are told that all of the major news stories would have once been drawn firstly from the Times. Equally notable is the more favourable light that the documentary casts on WikiLeaks and its founder Julian Assange. 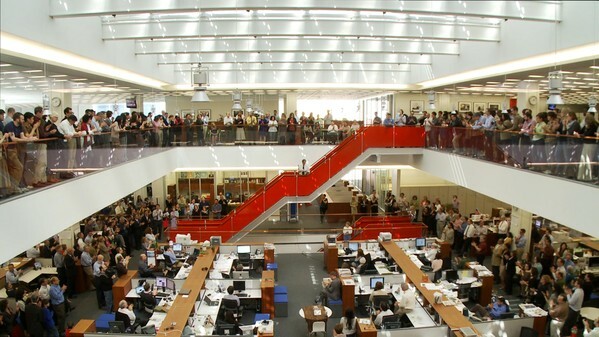 Reporters working in the Times regard his site as another source of information that they can use. Referencing WikiLeaks is also an intelligent example of the way that digital media has threatened to upstage print journalism for the big headlines. It’s pleasing that there’s real balance given to digital media here too. Although WikiLeaks is regarded as a legitimate tool, there’s a moment where the Times reporters debate whether to write on a released Youtube video showing US soldiers opening fire on a group. They discover that the video was cut significantly, removing footage of an insurgent aiming an RPG weapon. This rightly hints at the way that information can be cunningly manipulated and reworked by various forms of media. And personally I believe that unedited and opinionated blogs are more likely to fall into the trap of rumour and misinformation because they are frequently written with a specific agenda. More amusing is when the Times learn that NBC is hosting a parade overseas for the soldiers that neither the White House nor the Pentagon knows anything about it. We briefly see the panic between the editors, fearing that they might wake up the next day and discover that it was a real story and they’re the only ones who didn’t run with it. That’s an insightful moment, showing how important it is for print media to keep in touch. I also enjoyed the company of reporter David Carr. This bloke is a real character. A recovering crack addict and now a single parent, Carr is a passionate defender of the paper and rather hilariously shuts down anyone who tries to talk about its demise. There’s a very funny scene where we’re introduced to a twenty-one year old blogger who was hired by the Times. David says that he is convinced that the kid was a robot built in the basement of the Times to destroy him. He also makes an excellent point when someone tries to emphasis the punctuality of blogs over newspapers. He reminds everyone that the Times itself has over eighty of its own blogs, as well as hundreds of videos posted and asks why people would go to Facebook for information instead. His sarcasm brings a lot of personality to this documentary and I enjoyed the scenes with him the most. Disappointingly, the documentary misses a great chance to talk about physical technology in the form of tablets, like the Apple iPad. I was pleased and excited to see the documentary show the device but it doesn’t elaborate on what can be done with it. A tablet can provide readers with not only continuously updated information but also unlimited writing space too. As someone who is aware of film criticism, for example, being reduced to decreasing bites in print media, that’s a pretty significant point to understate. 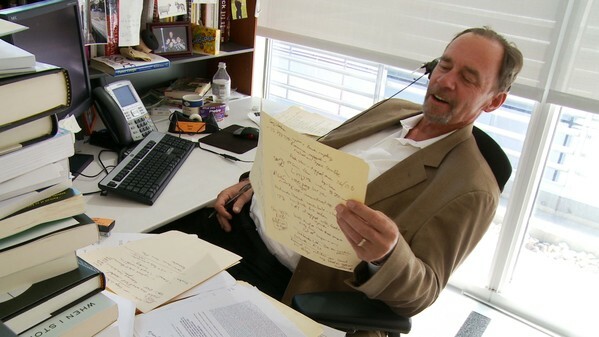 Overall, despite the small pockets of information, the delicacy to balance the film and the colourful presence of David Carr, I could still only recommend this as a late night television viewing, rather than a full price theatrical release.